Up Stop: Front knuckles hit the up stop when you press down on the car. The knuckles hit the top suspension mounts. The two fundamental characteristic of a spring is the spring force and spring rate. For mini-z, spring rate is more important than spring force. The following is an argument for why. Spring rate is how much spring force changes when you compress it. Sports cars have high spring rate. Is hard to press the suspension down. The car does not roll much in a corner. Cadillacs have low spring rates. Is easy to press the suspension down, and they roll a lot in a corner. If all you have is a spring with low spring rate, we call that a "soft" spring. The car is going to roll more. There is a way however to pervent the car from rolling so much. You can place shims on the spring so the knuckles seat hard against the down stops. Atomic makes a "Front Collar Spacer Set" AR121 that includes 4 different size spacers from .2mm to .5mm to preload the spring. If you preload the knuckles against the down stop with as much force as suspension would experiance in a hard corner, then the car would never roll. The problem with that is that you also loose down suspension travel. A little down travel is necessary for good traction in a corner. Also, suspension would react only when a bump is large enough to unseat the knuckle against the hardstop. For all the little bumps, the suspension is locked out. It acts as if there is no suspension. Spring comes in different lengths. All else being equal, a shorter spring is more versatile than a longer spring. With a shorter spring, you can always shim it up to give a higher ride height. With a longer spring, you can place spacer under the knuckle down stop to lower the ride height, but that also compresses the spring and preloads the knuckle against the down stop, which cause all the problems mentioned above. If you don't know how long a spring you will need, just get the shorter ones along with the Atomic spring spacers. So while you can compensate a soft spring with spacer to reduce roll in a corner, it is better to use a stiffer spring. A stiffer spring may not react to bumps as well as a softer spring, but there is still some reaction, and a lot of times, that is enough. Too stiff of a spring, and the car will bounce off the track with each bump. You start to loose traction in a corner. One way to limit body roll and not use too stiff of a spring is to use a sway bar described next. A sway bar or anti-roll bar is a "U" shaped wire that ties the left knuckle with the right knuckle. When one knuckle moves up like the outside wheel in a corner, the bar tries to life the inside knuckle up also. Now, instead of just the spring rate of the outside knuckle, you are adding the spring rate of the sway bar in series with the spring rate of the inside knuckle. Now, you can use a soft spring to handle the bumps, and have high roll resistance in corners as well. When the car hits a long bump like a speed bump, both front wheel goes up, and the sway bar also goes up. Spring rate does not change when both wheels hit a bump. Question is what happen when only one front wheel hit a bump. The answer is that the spring rate for that one front wheel will be higher because it has to also twist the sway bar and compress the opposite front wheel. However, that is not as severe a jolt as you might imagine because of the added spring rate. For one thing, when only one wheel goes up, the weight of the car is bearing down on that one wheel. Therefore, having a stiffer spring rate for that one wheel compensates for that one wheel trying to lift the weight of the car. Secondly, when one front wheel hit a bump, the sway bar is trying to lift the opposite front wheel also. This cause the front end of the car to go down. The end result is the wheel hitting the bump is taking more weight of the front end of the car than the wheel that is not hitting the bump. This is because the sway bar is trying to retract the wheel that is not hitting the bump. Sway bar is a very good thing for handling. Almost all full size sports cars have sway bar in either front or both front and back. Note that because a sway bar effectively increase the spring rate, the front will understeer. Same as if you place a stiffer spring in the front. The front suspension rides on the king pin. The stock Kyosho king pin is made from steel with black oxide coating for corrosion protection. However, the oxide coating is like sandpaper, and does not allow the knuckle to slide easily. There is quite a bit of sticksion. The suspension tends to stick and not move. Replace the king pin with a stainless steel one immediately cures the problem. Is almost like magic. For even better performance, you can polish the stainless steel king pin using some metal polish. Several aftermarket companies sells stainless king pin. Even Kyosho has one. The PN racing one I have works quite well. For the cheap method, use very fine emery paper to polish the stock king pin. You will loose the corrosion protection, but have a smooth king pin. One thing that the front suspension don't have is damping. Using some damping grease on the king pin may help with car handling. Most people run dry. Chamber refers to how much the wheel is tilted. Looking straight back from front of the car, the stock wheels are perpendicular to the ground as it should be. A negative chamber means the top of the wheel is tilted inward. You can get 1 to 3 degrees of chamber by using different steering knuckles. Reason for chamber is as the car leans in a turn, with a little chamber, the outside tire which takes the most turning force will become vertical to the ground and give the most traction. A 0 chamber will have high steering at low speed or gentle turns but loose traction on high force turn. A more aggresive 3 degree chamber will have more traction on high g's turn, but less traction on low speed turns. In practice, the front tires wears in to whatever chamber you have on the car. If you have no camber, the front tires will wear at an angle. With about 1.5 to 2 degrees of camber, the tires will wear evenly. 1.5 to 2 is a pretty good camber to use. 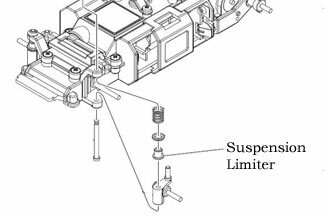 Suspension like the PN double A-arm front suspension or the MR03 strut suspension has camber gain. This means that as the wheel travels up, suspension geometry cause the wheel to increase in camber. This means that during cornering, the outside wheel will travel up due to lean of the car. With camber gain, the front wheel will still be parallel to the ground. The advantage is that you get better traction in the corners. Many racers have shown the double A-arm to decrease their lap times. The MR03 front suspension that also have camber gain. However, parts of it will have to be changed to lower the car first before it can be very competitive. Stock suspension limter heights are .161",.181" and .201". The longest one allows for 1mm of suspension travel while the shortest one allow for 2mm of travel. For RCP track where it is very smooth, use the shortest one. Some people recommend cutting even the shortest one even more down to about .14". At that height, chassis almost touch the ground at full travel, but with lean, there is some clearance. Key is you don't want suspension to bottom out. Then it will be the same as having no suspension. It will cause the car to understeer or unpredictable steering. The best place to start with setting up the chassis is to use a medium H-plate in the back and a medium spring in the front with a 1 degree knuckle or just the stock 0 degree knuckle. Use 8 degree GPM or PN tires or 20 degree Kyosho tires in back. They are all equivalent. Use 25 degree GPM or 20,25 or 30 degree PN tires in front. The Kyosho equivalent is about 30 degrees. The H-plate in the rear suspension is like a leaf spring in the old American muscle car. It winds up under the torque of the wheel. When tires loose traction, the suspension unwinds violently causing the shuttering sound especially around corners. On a real car, that would be wheel hop. The way to fix that is to use a damper. Kyosho sells an oil damper to replace the stock plastic spring housing. A more popular way is to use a damping plate. PN and Atomic are popular choices. 3Racing also has one that is a very good deal for about $14 versus about $25 for the PN or Atomic. The PN one is better thought out. There is an opening to tighten the motor lead screws or to change out the motor without disturbing the damping plate. Important since screws are screwed into plastic. You don't want to remove the screws too much. For the front end of the car, use softer springs for more traction and stiffer spring for less traction. Same with in the back, softer H-plate for more traction and stiffer H-plate for less traction. Use a spring like the PN Low Down spring set, they are slightly shorter than the stock ones, you can use them to lower the car. The result is that there will be some sag in the suspension. Take out the sag using one or two washers. Too many washers, and car will understeer. Too much sag, and car will also understeer. Use just enough washers so knuckle just touches the washer, then take one out to give one washer worth of sag. This tends to give good steering. If you find that the car spins out more to the right than left, place a washer shim on the left hand side between the motor mount and H-plate to correct the one direction spin out. Put shim on other side for the opposite spin out. Alternate method is the twist the H-plate while applying some heat to it using either a lighter or hot air from a butane soldering iron or other source. Sometimes, just twisting it will do also. For a right hand spin out, twist the rear suspension in the same direction as if the car was making a turn to the right with the left wheel tucked into the fender while applying heat to the H-plate. Opposite for the other way.